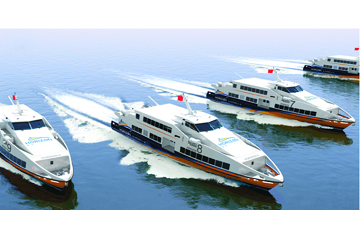 Horizon Fast Ferry is a well-known ferry operator that is based in Singapore. The company was previously named Prima Ferries, they have rebranded as Horizon Fast Ferrytogether with the arrival and introduction of their newly-built vessels.Guided by their company’s slogan “Horizon, your comfort choice.”The company has positioned themselves as a ferry operator to provide privileged and cost-efficientsea transportation services. To be able to stand strong in this competitive transportation industry, the company differentiate themselves by providing extraordinarily comfortable ferry trips instead of competing on ferry ticket prices.Buying their ferry ticket is a gain in wonderful sea ride experience and you can do it at the comfort at your home through Easybook anytime you want. Horizon Fast Ferry is headquartered at HarbourFront Centre which located at 1 Maritime Square in Singapore. HarbourFront Centre is a 3-storey shopping mall and also a ferry terminal connecting you toBatam Island, Bintan Island and theIndonesian ports nearby. HarbourFront Centre is the neighbour of the largest shopping mall in Singapore,VivoCity, which is situatedstrategically in the center of the HarbourFront Precinct. Besides that, HarbourFrontCentre is conveniently accessible with public transport as it connects straight to HarbourFront MRT Station. It is an exciting location with various of stores that include fashion, food, electronic devices and many more! To allow conveniencefor customers in Indonesia, the company has established a branch in Batam with the counter located at KomplekHarbour Bayin BatuAmpar. KomplekHabour Bay is alsoknown as theHarbour Bay Mall and it is situated at Harbour Bay Ferry Terminal. This 48,000-square meters’ mall where are able to spare some leisurely shopping time while you wait to board your booked ferry trip. There are more than 84 shops and a modern hypermarket in the mall, plus there are local restaurants, pubs and cafés toallow you to have a great meal before jumping on the ferry. You can even check outthe freshness of Batamseafood feast at the restaurants nearby to fill your hungry bellies. Horizon Fast Ferry has their newly-builtferries named Horizon 6, Horizon 7, Horizon 8 and Horizon 9 which are equipped with more than 250 seats in each vessel. To deliver extremely comfortable sea transportation services, the company has chosen the ferries with high quality to serve their routes. The designs of the ferriesare focused on the customers’ onboard experience which is to allow their passengers to have a cozy and spacious environment during the rides. Horizon ferries are created with an innovative idea where exclusive seating plan are designed on the upper deck which enhances a low-noise level environment enabling passengers to be seated comfortably even at its high speeds. Other than spacious legroom and comfortable seats, passengers will also be able to enjoy the wide horizon view and the warm services on board. With all ferries provided by Horizon Fast Ferry, the company is confident to provide their passengers an outstanding sea ride experience. Buy a Horizon ferry ticket and you will find it is more than its worth. Horizon Fast Ferry is a specialist offering ferry routes from HarbourFront, Singapore to Harbour Bay Ferry Terminal in Batam, Indonesia and vice versa. It takesabout 50 minutes of travelling time from HarbourFront to Harbour Bay Ferry Terminal as well as the return trips. Don’t forget there is a one-hour time difference between Singapore and Indonesia.Keep in mind that the time schedules are based on local time. You will find 9 departures for trips from HarbourFront, SingaporetoHarbourBay Ferry Terminal in Batam, Indonesia and 8 departures for return trips. Find out from your hotel if you are able to book for pick-up services from Harbour Bay Ferry Terminal on Batam Island for quick transfer to your accommodation to avoid all the scrambling to figure it outupon arrival. Singapore Flyer will be one of the top attractions in Singapore as it is the world’s largest giant observation wheel to enjoy the beautiful view when you ride on it. Another place that you cannot miss is the beautiful Gardens by The Bay. You will fall in love with the beautifully-designed green space as youvisit Bay East Garden, Supertree Grove and Cloud Forest Dome locatedwithin it. Besides that, food hunting in Chinatown is another exciting thing to do when you are in in Singapore as you try out the authentic Chinese food that will not forget. Visitingthe beaches in Batamhas to be in your must-do list when you visit this town. You would not want to miss the sunshine and the warm sea freeze at remarkableBatam beaches such as Marina Beach, Melur Beach, Turi Beach and more! It will definitelymake you forget about theworries in your mind.Check out the largest Buddhist temple in Southeast Asia, MahaVihara Duta Maitreya Buddhist Temple too which will definitely impress you with the fascinating statues of Buddha. You can also visit ViharaBuddhiBakti Temple or also known as TuaPek Kong Bio for those who are intrigued by the Buddhist culture. There are lots to discover when you travel with Horizon Fast Ferry! Start planning your trips to Singapore or Batam with Horizon Fast Ferryin order to enjoy the fantastic ferry experiences that the company will provide. Book Horizon ferry ticket at Easybook now or download our mobile app for free to purchase them at the palm of your hand. Find out how you can book the ferry tickets with this simple guide we have prepared for you here.